This review first ran in the June 22 edition of The Hamilton Spectator. Ask yourself three questions later tonight. Did you spend most of your day doing meaningful work? Did you fill your day with lots of positive interactions with your colleagues, family and friends? And did you sustain a high level of energy from morning to night? Answer yes and you’re likely ending your day with a full charge that will carry over into tomorrow. That’s good news for you and your employer. If you answered no, take comfort in knowing you’re not alone. Rath and his team surveyed 10,000 people and found that only 20 per cent had spent most of their day doing meaningful work, 16 per cent had positive interactions with others and just 11 per cent reported having a great deal of energy. According to Rath, you don’t turn things around with a one dramatic change. You start taking a few small steps every day on three fronts. Do something that benefits another person. Create far more positive than negative moments. And make smart choices that improve your mental and physical health. Start approaching work as a purpose rather than a place and find a calling that’s higher than cash. Be leery of anyone who extols the pursuit of happiness and tells you to follow your passion. To strengthen interactions with colleagues, family and friends, aim to be 80 per cent positive, says Rath. Put away your digital pacifier and only use your phone when you’re alone. Give people your undivided attention. To boost your energy, put your own health first. Start making smarter choices every day about what you eat, how often you move and how long you sleep. A study by the Harvard Medical School found sleep deprivation is costing the American economy $63 billion a year in lost productivity. Sitting at a desk or in meetings for eight hours a day will both destroy your soul and wreck your health. 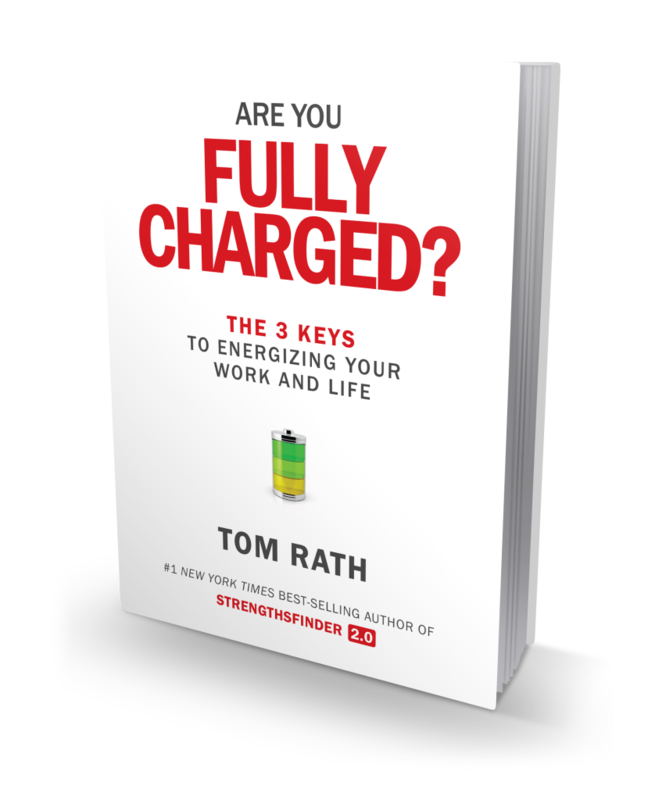 The questions at the back of Rath’s book will help you be honest about where you’re at and where you need to start making small changes that add up to getting you fully charged. Start making those changes today. LIfe’s short.